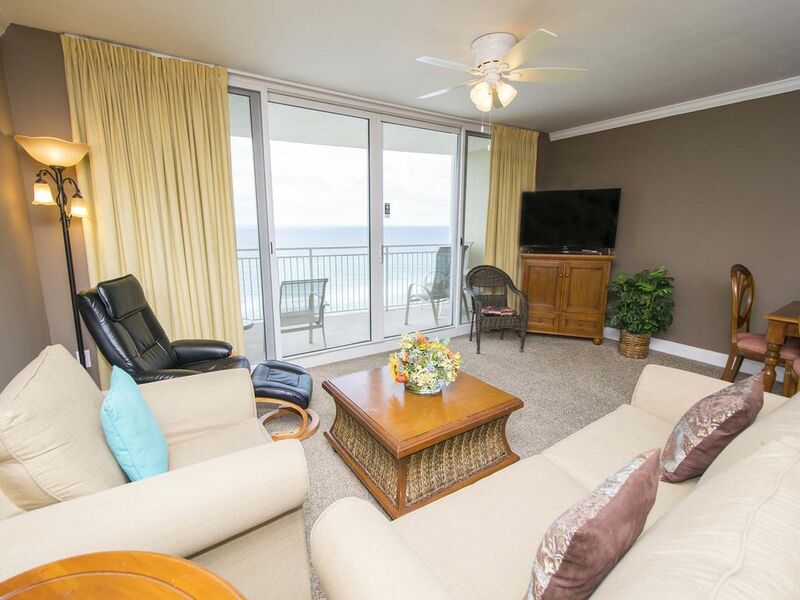 Breathtaking views, incredible amenities and generous floor plans await you at Emerald Beach #934 in Panama City Beach, Florida. This one bedroom condo sleeps up to 6 people, making it the perfect location for a family beach vacation. This condo comes with a fully-equipped kitchen, free wifi and a private balcony for your comfort. Treat yourself to a day at the spa, or enjoy a round of golf at the nearby 27-hole championship course at Hombre Golf Club. Grab a cup of coffee at the on-site Starbucks in the morning and spend the day relaxing on the beautiful beaches. At the end of the day lay your head on the plush pillows of your king bed while the kids curl up for a good night of rest in the twin bunk beds and the queen sofa sleeper in the living room. I have been going to PCB for many years and this was one of the best places I have stayed! The room itself was clean, had a fully stocked kitchen, and good WiFi connection. We have a baby, so the carpeted living room was a plus. The overall property was clean and the staff was friendly and helpful! The game area and kid pool was also nice since we have a 6 year old! She loved it! It's close to everything as well. We would definitely stay again! We are delighted to hear that your vacation was perfect and you loved our condo. Emerald Beach is a great resort for families as you found out. Please come back and join us next year! Hello Mindy- Thank you for your feedback. Please stay again soon! I think the resort and condo were great. I only have two recommendations 1. Each bathroom needs a trash can. Cannot believe they did not. 2. Checkout at 9:00 am is ridiculous. Next time will look for a condo with 11:00 checkout. This is vacation, not work. Thank you for your great feedback. We will look into your recommendations. The unit is on the 9th floor adjacent to the elevators and trash chute with the bedroom window facing these as well - convenient but occasionally noisy at night due to inconsiderate vacationers. The balcony is roomy with a great view and high enough to avoid noise from the pool area yet still hear the crashing waves. The WiFi was sufficient to lookup and plan outings or read/send emails but I wouldn't count on a lot of streaming. As for Emerald Beach. It is a HUGE development with plenty of amenities but has the busyness to match. The bar (usually empty) in the sky way creates a narrow walking space from the parking deck to the units and is often crowded with people and loaded luggage carts. Getting your cart from the parking deck to the unit requires using two elevators and the carts can be anywhere. The elevators were quick, but hot and dirty with most floor indicators non functional so you have to peek outside to see which floor you are on. The beach pool is small and, during my stay, did not allow coolers or alcoholic beverages. This was obviously for the benefit of the "tiki" bar located at the pool and a ridiculous limitation - the bar is also open to the public. Pool and beach access are via interior double doors and narrow boardwalk which was problematic for people with kids and/or a lot of gear to carry out. Beach was clean but packed with two rows of rental chairs fairly close to the surf. The store and Starbucks located in the parking structure did not keep set hours and I never was certain of when either was open. For myself, this was not the place for a quiet and relaxing vacation. The property management company was efficient and thorough in providing all the information necessary before, during and after my stay. Access to info was via mobile which loaded quickly and covered everything. All items required by Emerald Beach were waiting for me in the unit. Thank you for your detailed feedback. These items are great for future visitors and ourselves to know. We hope that you stay with our company again soon! Condo was nice and clean. View was beautiful. I would request this unit again. Check in and out was flawless. Elevators were fast and never an issue with waiting. The only issue we had was standing water issue outside the front door. After it rained the water remained the entire 4 nights of our stay and we couldn’t get anyone to clean it up. Only a caution wet sign was put out. I called security who was suppose to tell housekeeping and I sent message to Southern Vacation Rentals who stated work order was placed. It was so bad one night that water came in a little underneath the door we had to keep towel at the door. It was a pain to step in water every time we left and entered the condo. I am not being negative but hoping this issue is fixed for future renters. I had no other issues and would return to this unit. I personally would have liked the condo to be brighter colors, the dark brown walls, dark carpet, furniture seemed to make it dark and I think a beach rental should feel more bright, warm and cheerful but again that is just personal opinion and I wouldn’t let that keep me from renting again. Those reasons listed above are why i didn’t give it a 5 star rating. Had a great time overall and hoping to return. Thank you for your feedback. We apologize with the issues that you did have but are glad that you would want to return again. We hope you do visit us again next year. Great condo!!! Can't wait to come back!!! Thank you, Jessica. We can't wait to have you back next year!